For many years, I believed leadership was about vision, certainty, confidence, and solutions. With a wall full of degrees, a position high in my school’s organizational hierarchy, and a job description demanding action, I felt it was my obligation to make decisions that would propel our school forward; perceived it to be my responsibility to tell rather than to ask, and to know rather than to search. How painfully wrong my perspective proved to be. The economic downturn of 2008 hit the school of which I was then a part quite hard and demand for tuition assistance sky-rocketed, leaving the school with a painful choice; say farewell to students whose families could no longer afford tuition or function with a large deficit. The decision was made by the Board of Trustees to run at a substantial deficit for one year, and to craft a more sustainable business plan moving forward. As lower school principal, I was called upon to drastically cut expenses, primarily by eliminating positions, while at the same time significantly raising the quality of the school to more effectively compete with the growing competition we faced. It was a perfect storm. 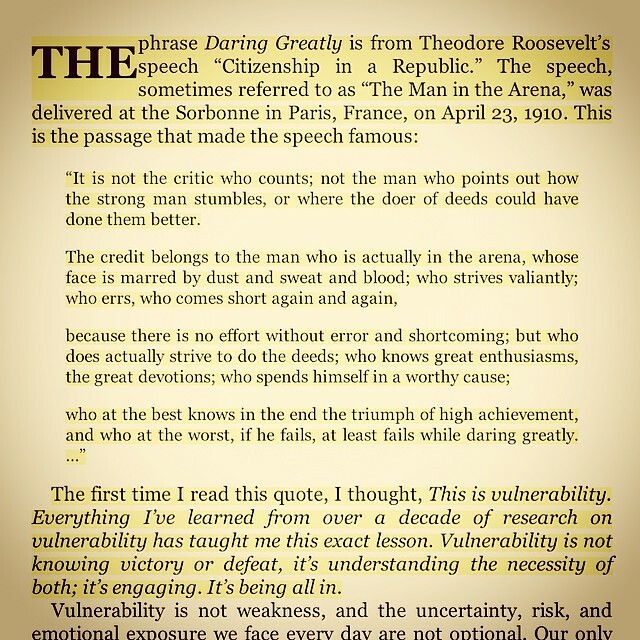 I wish I could say I navigated through the turbulence with the courage, compassion, and connection that Brene Brown describes as the hallmarks of wholehearted living in her book Daring Greatly: How the Courage to Be Vulnerable Transforms the Way We Live, Love, Parent, and Lead. Being honest with myself, I was painfully unprepared. I floundered, made mistakes, and lacked the wisdom to know how to engage others in courageous, compassionate, connected discomfort. I did not yet know how to embrace vulnerability, to humbly engage in difficult conversations, to ask for help, and as Brene Brown so articulately advocates, “to lean into the discomfort of ambiguity and uncertainty, holding open an empathic space so people could find their own way”. Through the heart-wrenching pain of letting teachers know they would no longer have positions, demanding more of everybody, responding to increasing perhaps unrealistic expectations of me, and absorbing tremendous anger and distress, I faltered. Through many angst filled, sleepless nights and long, agonizing days, I found myself ill equipped for the many challenges facing me and recognized I needed to learn new ways of leading. My transformation as an educational leader in some ways mirrors Brene Brown’s description of Lululemon’s CEO Chrstine Day’s leadership, moving from “controlling to engaging with vulnerability – taking risks and cultivating trust.” Day characterized the changes in her leadership as a shift from “having the best idea or problem solving to being the best leader of people”. Over the course of several years, I invented my leadership anew, learning to focus on supporting more than directing, coaching more than evaluating, wondering more than answering, and imagining collaboratively more than deciding individually. I accepted a new position as Head of School in another school community, crafting my approach to leadership with hard earned insights on vulnerability, risk taking, and trust building. Echoing Brene Brown’s articulate words, “I’ve come to believe that a leader is anyone who holds her- or himself accountable for finding potential in people and processes.” I embraced leadership as serving to unleash the greatness in others. To that end, there are many techniques from the world of coaching that I have deliberately trained in and implemented, most significantly, giving feedback. Like Brene Brown, I have found receiving and giving feedback to be the key to normalizing discomfort, helping individuals to lean into discomfort with safety and support in order to stretch, to learn, to overcome challenges, to build on strengths, and to reach toward aspirations and potential. “At first, I was terrified by the idea that if education is going to be transformative, it’s going to be uncomfortable and unpredictable,” states Brene Brown, a sentiment that captures my intense emotion prior to the paradigm shift leading me from a leadership model focused on “knowing” and telling others what to do to an approach focused on “being”, deliberately nurturing trust and collaboratively striving toward shared, aspirational goals. In order to give feedback, I first had to be open to receive feedback. For that, I needed to embrace vulnerability – accepting that not only can mistakes and crises happen, but for any person or community that is striving to improve, mistakes and crises will occur. Acknowledging the inevitability of failures on the road to improvement enabled me to develop my resilience, patience, and fortitude in the face of challenge. I not only normalized discomfort for myself, but even became more comfortable with discomfort, welcoming the growingly familiar tension in my shoulders and flittering in stomach that arises when I have stretched myself beyond what I have done before, when I worry I have moved too quickly or made a wrong turn, when I face criticism that feels unfair or when I face criticism I feel I deserve. I have come to welcome the discomfort for it is through the stretching beyond the familiar that I grow and become more effective, more capable, more courageous, compassionate, and connected than I was before. From seeking feedback for myself, I moved toward giving meaningful feedback to others – leading with a “coaching hat”; striving to focus more on support than evaluation. I revamped my approach to feedback; visiting classrooms as often as I could and sharing written feedback, including a compliment, and nonjudgmental reflections following four prompts: I noticed, I wonder, what if, and how might. I met with each teacher to set a professional learning goal, along with an action plan, supports we would put in place to help the teacher meet the goal, and ways we would measure progress toward the goal. I shared with each teacher that our end of year reflection, in lieu of formal evaluation, would not focus on whether the goal had been achieved, but rather on how much the teacher, and her or his students, had grown. I wanted teachers to adopt ambitious goals rather than playing it safe, and in order to do so I needed to create a culture in which striving was celebrated and protected. Teachers and I also filled out a rubric on professional practice as another means to reflect on practice, celebrate strengths, and identify areas more challenging. I made the commitment to teachers that the process would be focused on learning and that if I had a specific concern, I would be direct and share my concern with the teacher; enabling most conversations to be focused on professional growth and exploration of the possible, rather than being evaluative and judgmental. I reveled in teachers’ learning and growth; celebrating with teachers their forward progress. As we embrace one another’s strengths, along with one another’s quirky imperfections, we engage in painful yet potentially transformative disruption, offering the promise of engagement, creativity, innovation, productivity, learning, and trust. The key to this transformation is a frightening, yet potentially liberating, embrace of vulnerability. I welcome you to engage in courageous, compassionate, connected conversation on vulnerability and growth. How have you cultivated the courage to be uncomfortable? How have you helped people around you to accept discomfort as part of growth? How has discomfort helped you to learn and to grow?